Apartment Encian is located in Žirovnica. The property features mountain views and is 49 km from Ljubljana. The apartment comes with 2 bedrooms, a kitchen with a dining area, and a bathroom. A flat-screen TV with satellite channels is featured. Offering free bikes, Hostel Jakelj is located in Lesce. Free Wi-Fi access is available in public areas and free private parking is available on site. Featuring a garden, free bike rental, and horse riding facilities, B&B Zima House offers rooms with free Wi-Fi and a daily continental breakfast in Žirovnica. Bled is 9 km from the property. Rooms at the Zima come with a TV, heating, and a wardrobe. Located in Žirovnica in the Gorenjska region, Apartment Krek has a balcony and mountain views. The property was built in 1990 and features accommodation with a patio. Enjoying a quiet location 10 km from Bled Lake, Fine Stay Apartments is surrounded by nature and greenery. It offers a terrace and free-to-use BBQ, as well as a garden and free Wi-Fi access. 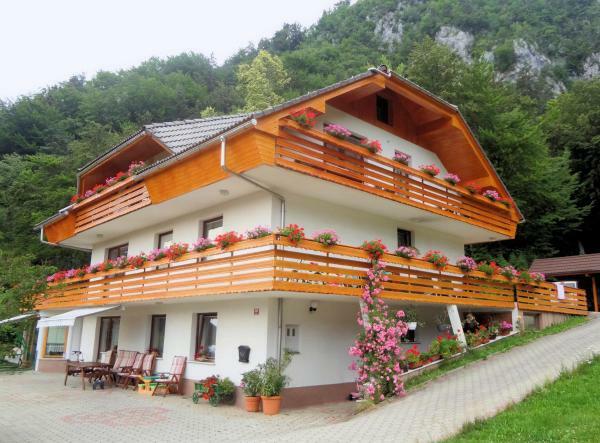 Set in Žirovnica, Brunarica Sova-Chalet Owl features accommodation with access to a garden. All units come with a terrace with garden views, a kitchen with a fridge and a stovetop, and a private bathroom with shower. Set on an elevated position of 1180 metres, Valvasorjev Dom offers accommodation in Žirovnica. Villach is 31 km from the property. Free private parking is available on site. Every unit has a shared bathroom with a bath or shower.